Enjoy deeper, more restful sleep with fewer interruptions. 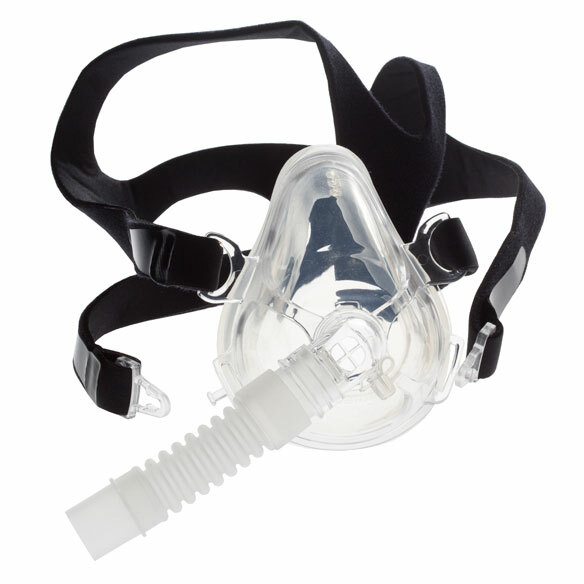 Full face CPAP mask is designed for premium comfort and effective sleep therapy every night. 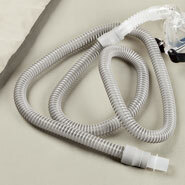 Frame stabilizers evenly redistribute pressure over a larger area, reducing that feeling of high CPAP pressures. Silicone contact is soft against skin and fits like a dream, so you can breathe easily without noisy mask leaks. Designed without a forehead pad, so you can read or watch TV without obstruction before comfortably sleeping through the night. 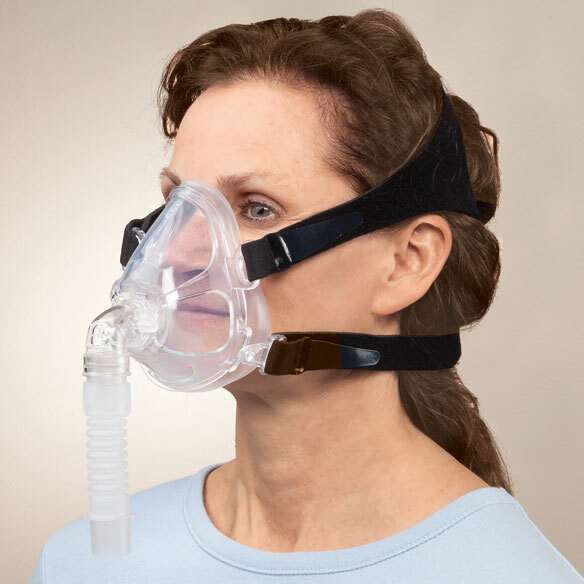 Deluxe CPAP headgear provides effective sleep therapy. Evenly distributes pressure for comfort and stability. Soft, silicone-lined contact gently conforms to your face. Breathable fabric straps wick away moisture. To size, measure from bridge of nose to bottom of lower lip. The mask is a great fit. It has a soft, snug fit so there are no air leaks or vibrations. I'm very happy with it. It makes a slightly different sound than my old one so at first, it seemed noisy. But now I don't even notice it and sleep peacefully all night. No, you don't need a prescription for the mask. The mask goes well with my son's Phillips CPAP. It's a good CPAP mask, but the straps are a little too tight. Drive Medical Design & Manufacturing out of Port Washington New York has a good design. Lightweight. Effective. Works well with my five year old cpap machine. I will never buy again. You can not keep the oxygen hose on. The air tube is way too thin. They need to make the air tube much thicker. I tried 3 different air hoses and all fell off. Husband needs a new one! this full face CPAP Mask is easy to put on for me. I was replacing my current mask. want to try a different type of full mask. I chose this because I have a severe case of OSA (Obstructive Sleep Apnea). I was diagnosed with it on March 9, 2006. 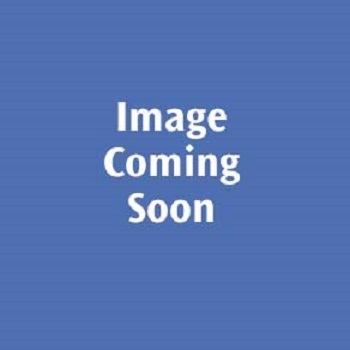 My doctor is Thomas Freedom, M. D.
shopping was quick and easy and they had everything I needed! I need this mask. it appears to be just what I want. thank you. This is the one I like. I needed a new one. we had the noise mask before and my husband really liked it. I need one to replace the one I have. Because the mask I have is breaking my face out and I can't sleep with it. Need a backup mask, and am hoping this one will work as well as the one I have. My son needed a replacement . Does this mask also include the headgear as is stated in the overview? What are the measurements for your medium and large full-face masks, so that I know that I'm choosing the right size for me? BEST ANSWER: Thank you for your question. The small will fit 3" - 3 1/2", the medium will fit 3 1/2 - 4", and the large will fit 4" - 4 1/2" You can determine the size by measuring from the bridge of your nose to the lower lip. We hope this information will be of help to you. BEST ANSWER: Mask and head gear are included; however, the head gear is very tight in the beginning because it is new. After wearing for a couple of weeks, it will loosen up. Yes but the headgear that came with did not fit my husbands machine ! Yes, it comes with the straps that go on your head to keep it on. As I remember, it is included. Is this available without prescription? BEST ANSWER: Thank you for your question. The mask can be ordered without a prescription. We hope this information will be of help to you.